Still worrying about the phone being out of power? Power bank capacity is too small? Is it inconvenient to carry? The ES-982 solar power bank supply meets all your needs. Today, the power bank has become a must-have for people to go out. Our product can be charged by DC5V and solar energy, especially for users who enjoy outdoor sports or travel. And there are three USB ports that can charge three devices at the same time, both for yourself and your friends. In addition, 36 LED high-illumination lights make it easy to deal with power outages or nights. It is a nice gift for outdoor or travel enthusiasts. ?25000mAh Ultra High Capacity Solar Charger?The solar panel charger built-in 25000mAh Li-polymer battery, it's enough to charge an iPhone XS for 7.4 times, a Galaxy S9 Plus for 5.7 times, an iPad Pro for 1.6 times! ?Two Charging Methods?The Solar charger power by Adapter or Solar. The blue indicator light is on when charging with the adapter, and the green indicator light is on when charging with solar panel. ?3-USB Ports for Charger?The solar charging powerbank has three USB ports that can charge three devices at the same time, which is convenient for yourself and your friends. ?ABS Material with 36 LEDs?The USB power bank used ABS environmentally friendly material, stylish and decent. 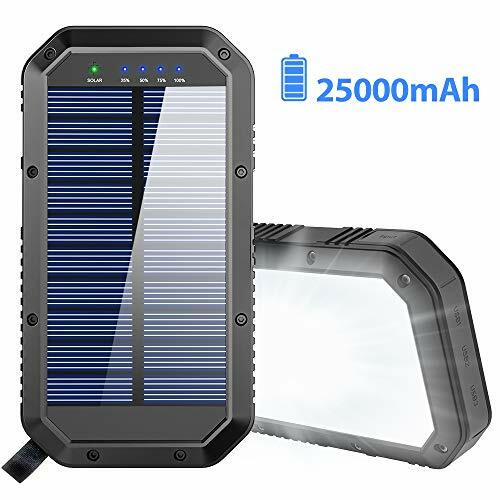 Built-in 36 LED lights with powerful lighting function,this Solar phone charger is the best choice for outdoor enthusiasts. ?ONE-YEAR WARRANTY for Solar Power Bank?We've got you covered by our One-Year warranty if anything goes wrong, our fast, friendly and hassle-free customer service team is here for you.